The expectations that we have about Valentine’s Day are so ingrained culturally that being single has almost become stigmatized for the day. It’s the one day of the year when the status of our relationships -and our relationship status- is on display and judged by those looking in. Being single on a day that has become a celebration and display of love for another is one thing, but being rejected by your partner for an affair is a double whammy. Watching colleagues send and receive flowers at work and friends arranging romantic dinner dates? Oh joy, because you’re at home contemplating a McD’s Unhappy Meal, viciously stabbing a chicken-something nugget with a plastic spork as if it were your cheater’s head, trying to not to hate everyone else’s apparent happiness. And all those people that tell you to count your blessings? GAH! Feeling that you weren’t worth sticking by, being committed to, loving? It can feel that every side of the bed is the wrong one to get out of when faced with those thoughts and feelings of rejection. Add in the extra layer of the affair partner and the sickening feeling that they will be the recipient of your cheater’s Valentine’s Day attentions? You probably want to shank them first, before crying an ocean of tears that won’t even begin to drown out your pain. Dealing with an affair on Valentine’s Day can feel like a massive hurdle – the affair killed your old relationship, it altered your view on love and marriage and soul mates, and it massacred your understanding of who you believed your partner to be. The affair killed who you thought they were and replaced them with this strange and hurtful lookalike-cheater-thing that you don’t understand and hardly recognize. It’s debilitating. Even if you’ve chosen to reconcile, Valentine’s Day can be a minefield of triggers and missteps. Those who are some years post-reconciliation will probably have their own strategies for holidays with their partner, but in the first couple of years it can be fraught with anxiety and pressure. If you’ve recently started to reconcile, you may find that your hurt surfaces in anger and accusations because you’re being triggered into reflections about love and commitment, or even your cheater’s previous Valentine’s celebrations with the affair partner. Don’t be surprised if your first Valentine’s Day in reconciliation is more painful than you originally estimated. A past affair can entirely overtake any enjoyment of this day as a couple – don’t let it. Resist the urge to use the day to beat your cheater up – if you didn’t want to enjoy these times with them, why reconcile? Suspend active reconciliation work for the day and just enjoy each other without all the deep conversations and affair post-mortems. The angst of reconciliation will still be there tomorrow, so agree to call it an affair-free day and avoid Valentine’s Day fights. Discuss in advance if you (as a couple) want to celebrate the upcoming Valentine’s Day at all. Don’t say nothing and then be angry and disappointed if your cheater doesn’t do what you secretly wanted them to do – they’re not a mind-reader. Consider both of you taking the day off (especially if it was a work place affair) to do something fun together on Valentine’s Day, and enjoy the planning of the day together as part of your celebrations. Don’t only expect your cheater to make the effort to woo you to compensate for their affair. If they are worth reconciling with, then they’re worth you doing something for them too. If you’re reading this as a faithful partner whose partner/spouse is actively engaged in their affair when you really want your relationship to work out, you’d probably give your eyeteeth to be experiencing the difficulties in the previous section. All you want is a chance, and for your cheater to end their affair, declare their love for you, and recommit. Valentine’s Day underlines, bolds, and italicizes the fact that your cheater has rejected you for the affair partner. It’s tempting to use the day in pursuit of your cheater and in the throes of jealousy of all couples – don’t cave in to it. Don’t send Valentine’s cards filled with soppy declarations of enduring love. If you must send them a token, make it as short and as dignified as you can muster. Remember that if you chase them with love and guilt, you will likely be chasing them further into their affair. Arrange a fun night out with friends who also aren’t celebrating Valentine’s Day with a partner – go to a comedy club and have drinks, and enjoy some laughter for a change. Don’t sink your day into an active cheater. Their affair isn’t something you can control, so instead of using the day to try to induce or guilt them back to you, or to obsess over them, use it as a day to celebrate your own inherent fabulousness, even if you’re not feeling very fabulous at all. Don’t make comparisons between your situation and your perception of your cheater’s (and affair partner’s) happiness and idyllically romantic Valentine’s Day canoodlings. If Valentine’s Day is supposed to be a celebration of love then celebrate it with people you love and who love you. Take your children out, or let your family know that you really need their help in distracting you and getting you through the day. Ask for help when you need it and take it when it’s offered. If you don’t want to show your reddened eyes in public, grab some wine, some chocolates, and a box of tissues, and huddle up in front of some movies. Make your environment pleasant and comforting – light some scented candles, treat yourself to a firewood fire, order take out, and get cozy in your pajamas and a snuggly blanket. Call someone you know will be there for you if you need to hear a friendly voice. 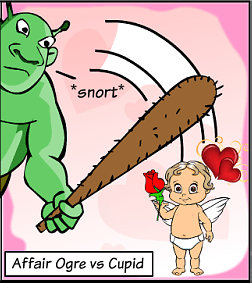 When all else fails, try remembering the origins of Valentine’s Day and consider it a lucky escape! In another time you would be struggling to avoid the pagan Lupercalian festival, sacrificing animals and either avoiding being lashed, or participating in the lashing of nubile young women with strips of the animal’s skin and blood. In later times, you might even be avoiding being put to death by Claudius for your defiant defense and encouragement of marriage. And of course, in more modern times, you might be avoiding a certain garage in Chicago, and being mightily suspicious of ‘police officers’ bearing Tommy Guns. Valentine’s Day – not so romantic after all? Don’t under-estimate the power and depth of modern Valentine’s Day expectations. Ashley Madison cites February 15th as their second highest enrollment day of the year (just behind the day after Mother’s Day), especially in women. If disappointing Valentine’s Days can lead people to believe that they are under-appreciated and unloved to the point that they are so disenchanted that they will sign up with AshMad, that’s a problem. If someone’s fidelity is balanced on a box of chocolates and a Vermont teddy bear you’re facing a far bigger set of issues than someone’s sense of disappointment, and a dozen red roses isn’t going to make that any better. Manage the expectations, come to mutual agreements on how to navigate the day, and give yourself a break from all the angst. Valentine’s Day is what you make it for yourself. Choose to make it either something fun and celebratory … or decide that it’s just another Sunday.